MSc Learning and Technology: Why am I here? The Financial Times (FT) columnist wrote a piece in the weekend magazine earlier this year, Welcome to the Virtual University. She had just come back from the World Economic Forum in Davos and claimed to have seen the future of higher education – it’s online. Check out the comments from readers, too. University tutors, she noted, are suitably cautious and cite the importance of a campus experience. The pace of evolution is, she also noted, relatively slow, especially in the UK compared to the United States. I had already subtly started bringing more technology into my own courses at Glyndwr University. Within journalism, we had looked at social media, data journalism, writing for online etc. 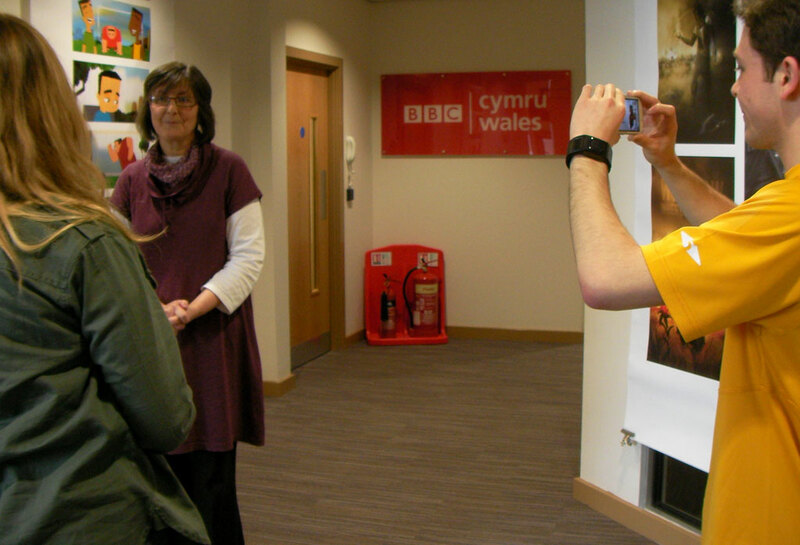 But maybe, instead of arranging a guest speaker like ex-BBC Wales journalist Sian Pari Huws [pictured above] to speak to the student cohort, I could start setting up guest slots online? Why hold drop-in tutorials when we can discuss in a news forum? And, with the economic model behind the university system looking increasingly flawed, then maybe I need to find new ways to deliver learning? Why did you sign up? Post your views below. It was time to party, they assured us, like it was 1413. As the bi-annual ITA conference drew to a close after a week of keynotes, workshops and presentations at Glyndwr University, we all retired to the Ruthin Castle Hotel for the Jester’s Feast, a modern-day recreation of a medieval banquet. It was a night of mead, meat and merry-making – a camped-up melange of Spamelot meets Carry On Up The Middle Ages. For some, the highlight was a rousing chorus of Men of Harlech during the second meat course. For others, it was possibly the goat-milking dance, whereby delegates were treated to a colour-guided guide to learning Welsh while pretending to milk the castle goat with the aid of a serving girl. Or possibly not. Either way, the conference is over and it wasn’t all syllabub and showing off. I ran the social media team, organising a group of five student bloggers to live blog the conference from Tuesday to Thursday last week. 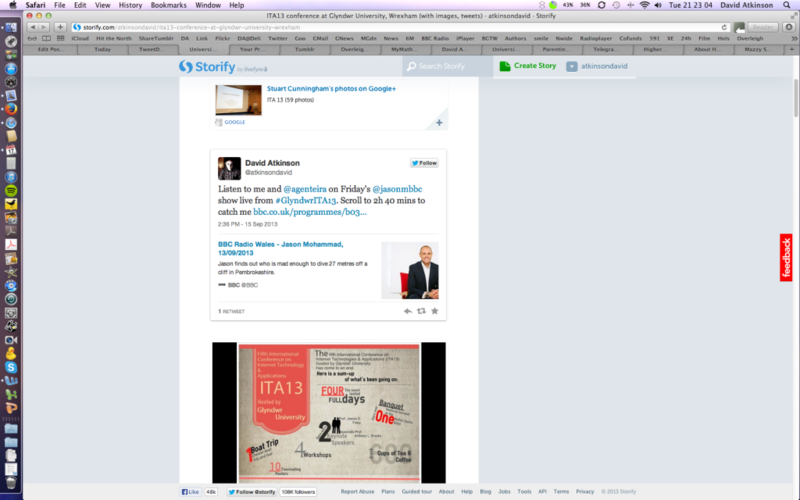 We worked hard and our collective efforts are compiled in this Storify, ITA conference at Glyndwr University Wrexham. Take a read. Let me what you think. * Liked this? 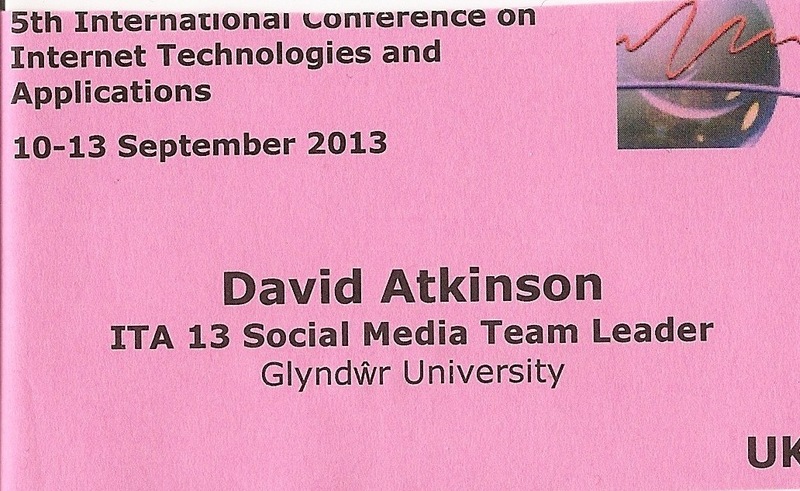 Try My contribution to ITA13 and ITA conference coming to Glyndwr University. Aside, that is, from co-ordianting the team of student bloggers covering the event – see ITA Conference coming to Glyndwr University. The above image is my entry for the poster showcase, whereby contributors interested in potential research projects put forward their ideas for review, discussion and the slim hope of being offered large sums of money to develop the project as a major study. 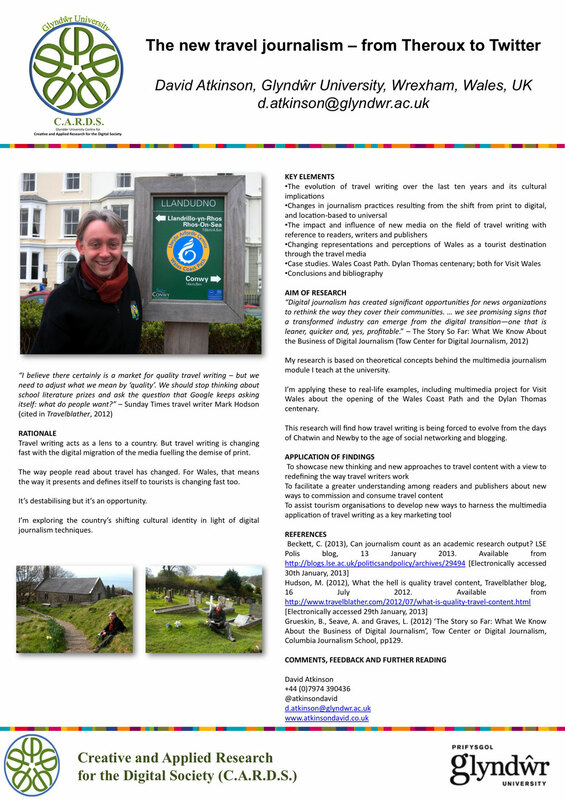 I’ll be manning the poster stand on Wednesday afternoon next week if you want to discuss in person. If you like the idea, contact me via the homepage. * Back on campus this week and gearing up for this major conference coming to Glyndwr University from September 9. My group of student bloggers [pictured above at MediaCityUK] will be covering the event – look out for updates with the hashtag #GlyndwrUni. Registration is under way for the fifth International Conference on Internet Technologies & Applications (ITA13) to be hosted at Glyndwr University in September. The biennial conference, which features a range of keynote speakers, workshops and fringe events, returns to Glyndwr University from September 10-13. It brings together researchers from academia and industry developers from digital media, computing and engineering. The conference has been held in Wrexham since 2005 and will this year attract over 70 delegates from over 30 countries. The wider programme, including an exhibition of research posters, workshops and demonstrations of new technology in the foyer, will open up the event to the public for more general interest. In-between-ness: using art to capture a sense of self, an exhibition of paintings, film stills and moving image by contemporary artists Karen Heald and Susan Liggett at the university’s Oriel Sycharth Gallery, also forms part of the programme. Student journalists from the Broadcasting and Journalism programme will be live blogging the conference and events around it. Follow updates on twitter via the hash tag #GlyndwrUni.